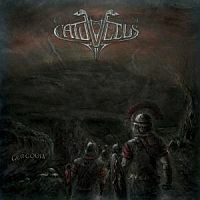 This concept album is apparently an homage to the Gauls that fell before Caesar. That isn’t the sort of premise that normally gets me going - I have a great interest for the subject but not for it being adopted for an album’s theme. A mellow intro number gives way to fairly indescribable death screams that shield any sense of story. The music is totally subdued by the vocal and the song is noise at best. “La Colline De Chanturges” offers something fast and vaguely melodic but those screams haven’t left. It’s a struggle to understand how the listener is meant to embrace the concept. The rest is forgettable and in a similar vein. “Impetus” offers a lead part that could have been developed but it returns to the band’s comfortable con-fusion sound where instruments merge into anonymity before being overwhelmed by the vocal coarseness. This sadly finds itself in the mass of similar offerings that don’t really excite or develop any new ideas. it’s largely been done before and often better. There is no sense of concept and the music is indistinct and blurred.